Abalone are a favorite food for some marine species including sea otters. Otters are one of the few tool-using mammals (besides man) and they are known to carry a rock that they use to crack the shell of the abalone underwater so they can remove it from its substrate. They then use the rock, at the surface, to crack the shell off and eat the yummy abalone. An occasional shark or large fish may be able to get small abalone off the rock for a meal, but, in general the abalone is well protected by its strong shell. 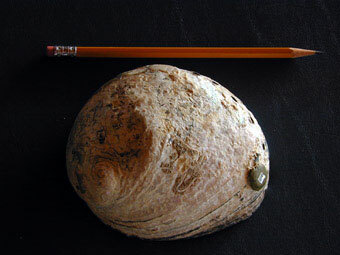 For thousands of years the abalone existed with its natural marine predators. Native Americans harvested abalone from the intertidal zone. The numbers of harvesters and their small area of harvesting (restricted to ‘picking’ abalone at low tide) probably had a relatively minor effect on the population of abalone. 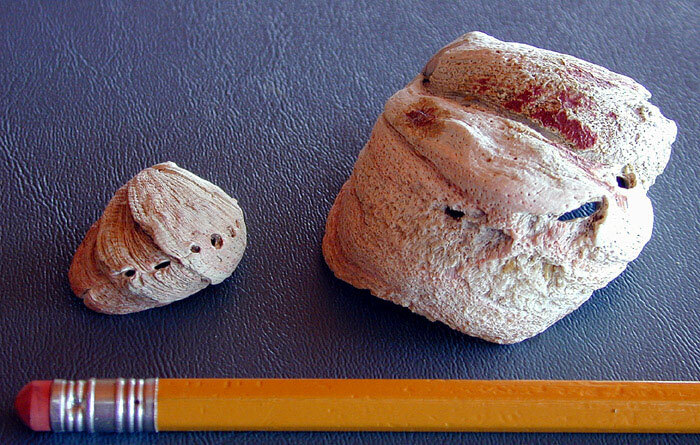 Abalone shell pieces are found in Indian middens along the coast of California, showing that this was a common food item for hundreds of years. Asians harvested abalone in California during the 1800s and early 1900s. Most of this was done intertidally in the late 1800s. and then by diving in the early 1900s. 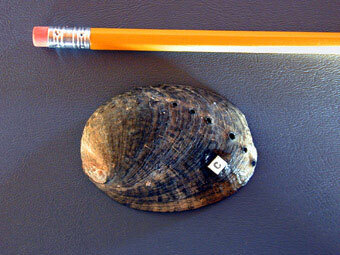 The supply of intertidal abalone quickly began to decline. Abalone diving became a popular fishery and sport during the 1950s and 1960s as developments in scuba diving made it possible for the general public to dive to depths of 100 feet or more. Thousands of abalone were taken with little regard for the future of the species. By 1970 it was a rare event to find an intertidal abalone except for the black abalone (that were not considered worth eating back then). Over 4.4 million pounds of abalone were taken between 1950 and 1970 by commercial divers, all in southern California. By 1996 less than ten percent of the usual take could be harvested by the remaining commercial abalone divers. It is thought that the sport catch in the 1960s, 70s and 80s was probably equal to the commercial catch. No wonder the abalone numbers declined. Environmental changes reduced the number of abalone. A couple of severe El Niños in the 1980s and 1990s created conditions in California were the ocean water warmed up, the nutrient level decreased and the kelp beds withered. Since kelp (a large brown marine algae) was a main food for the abalone this had a devastating effect on the populations of abalone especially in southern California (where the El Niño effect was greater than in northern California). Disease reduced the number of abalone. The withering foot syndrome (WS) is a condition where the abalone’s body becomes progressively smaller but its shell stays the same size. After awhile the animal can no longer hold onto the rock and becomes easy prey. It is an effect from bacteria in the animal’s body that results in its inability to digest its food so it starves to death. Although the bacteria that causes WS may be present in many abalone individuals (of several species), test have shown that abalone are able to harbor the bacteria yet not develop WS symptoms. It may be that tose abalone that are stress, by lack of forage (kelp) during warm El Niño periods when kelp beds disappear, develop WS symptoms and die. This disease hit southern California abalone stocks very hard in the 1990s. 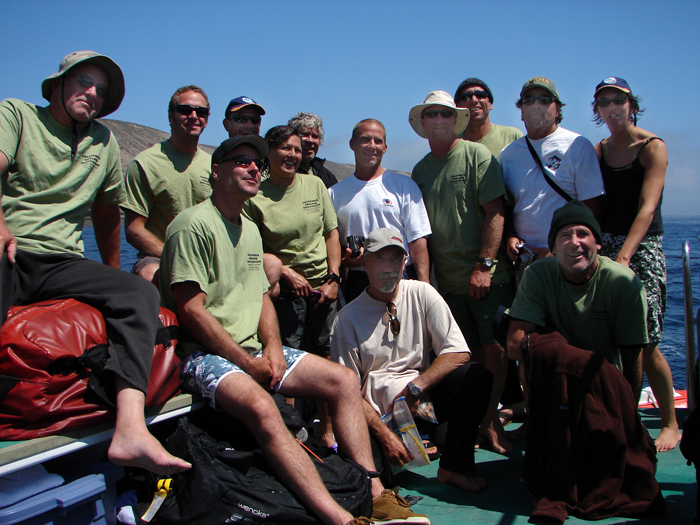 In 1997 southern California was closed to the taking of abalone by both sport and commercial divers. This ban was introduced by the California State Department of Fish and Game as it became apparent that the numbers of abalone in southern California were so small it was feared that some species would become extinct. Abalone can still be taken north of San Francisco but only by skin diving (no air tanks) and a special abalone stamp must be purchased in addition to the regular sport license. This allows funding of a program to monitor the status of the stocks. Abalone diving remains a popular sport and as the human population grows in Northern California these remaining dense beds of abalone above San Francisco are threatened by poaching as well as sanctioned take. Northern California was never open to commercial abalone fishing and while El Niños and disease have not impacted the population, there are areas of easy access that have experienced serial depletion. 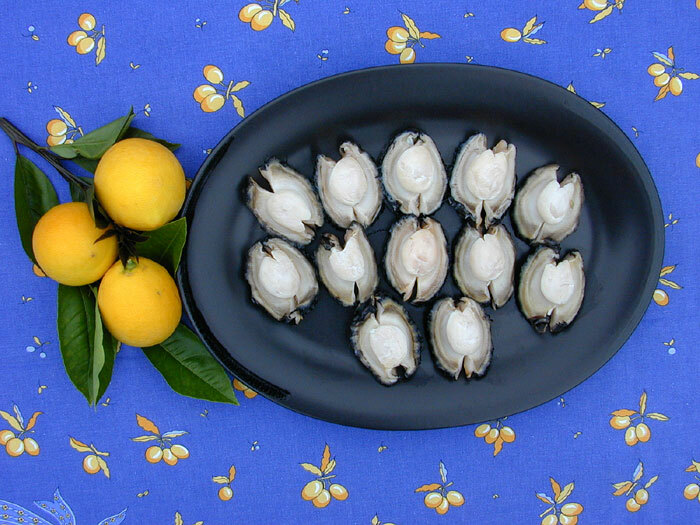 As abalone numbers decreased their price increased. This price increase began in the 1970s so that by the time the numbers of abalone were plummeting the price had reached a good $30 a pound. California had been one of the centers for commercial abalone harvesting and demand for the abalone was still high due to popular culture along the coast. Mariculture farms began to try to raise abalone starting in the 1960s. Most of these beginning mariculture attempts had little success. Adult animals were still reasonably easy to obtain from the ocean but getting them to spawn was nearly impossible. Harvesting the sperm or eggs from the animal did not produce any fertile offspring and killed the adults. It would only take one female and one male to make millions of baby abalone if their broadcast spawning could be controlled. A single female abalone releases millions of eggs with each spawn and a single male releases trillions of sperm. The potential for a mariculture industry was there but the biological information was not known yet. 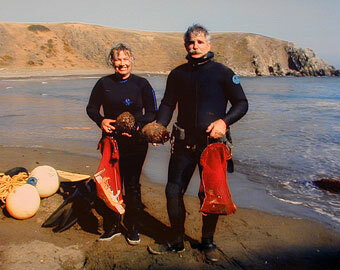 In the 1970s Dr. Daniel Morse began to research abalone spawning along with his other research activities at the University of California at Santa Barbara (UCSB). Dr. Morse was a biochemist and attacked the problem of spawning control from his biochemical perspective. He characterized the tissues of spawning and non-spawning animals. After a period of time he concluded that spawning abalone would release hydrogen peroxide in their tissues, then a hormone (prostaglandin) and then they would broadcast spawn some two to four hours after the hydrogen peroxide was found. Something in nature provides the stimulus for abalone spawning (hydrogen peroxide release) but this could never be determined. What Dr. Morse did was to experiment by adding hydrogen peroxide to the ocean water in tanks where abalone were kept. He discovered that he could ‘fool’ the abalone into sensing the hydrogen peroxide in the water and mistaking it for their own, then the hormone was released and the animal would spawn. 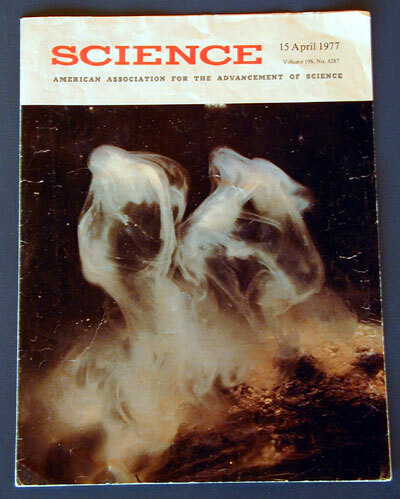 His landmark paper in Science Magazine (15 April 1977, Hydrogen Peroxide Induces Spawning in Mollusks, with Activation of Prostaglandin Endoperoxide Synthetase). provided information for any of the abalone mariculture farms to spawn abalone. It could be translated into a cookbook set of steps to ensure abalone broadcast spawning in tanks. This gave a big boost to the mariculture farms dealing with abalone. Mariculture farms spawned hundreds of animals and produced millions of abalone veliger larvae in the late 1970s. They had little success in getting the larvae to settle and metamorphose however, so their dreams of abalone meat production were still unfulfilled. Many of the farms contacted divers and fishermen to take bags and bags of veliger larvae out into the ocean and release them in the hopes of increasing the natural abalone population. No one has any idea if any of these survived but there were, indeed, millions released. Dr. Morse discovered how to get the veliger abalone larvae to settle. 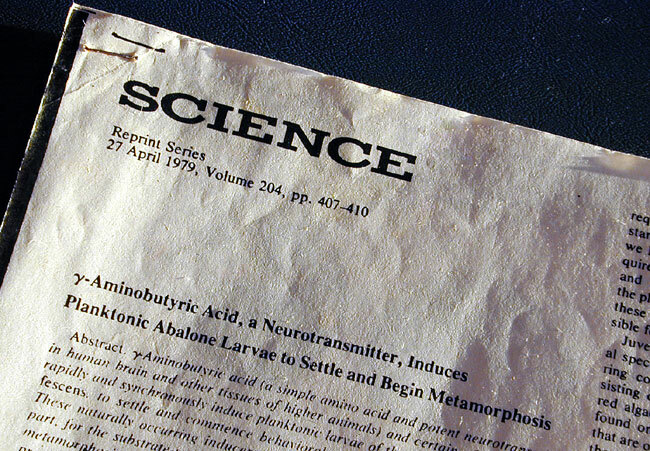 He wrote up his findings in the 27 April, 1979 publication of Science Magazine (Gamma-Aminobutyric Acid, a Neurotransmitter, Induces Planktonic Abalone Larvae to Settle and Begin Metamorphosis). This time it was with the information about his finding that GABA (gamma-aminobutyric acid, a chemical in baby abalone’s first food source) was the ‘cue’ to settlement. He published the concentration needed to add to the water with veliger larvae and within minutes they would stop swimming, sink to the bottom, and begin benthic (bottom dwelling) life. Again the mariculture farms were provided a boost by a research scientist. Abalone farms began producing abalone in the 1980s. Some of these farms used grow-out chambers located in the ocean and others did it in large tanks on land. Many of these farms continued and are providing maricultured abalone to restaurants in southern California. A few farms even sell at local Farmer’s Markets on occasion. Almost all of the mariculture farms are private enterprises. 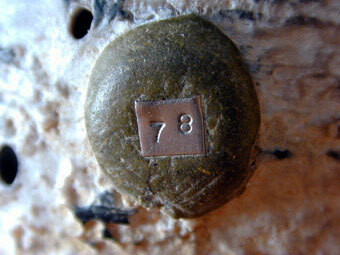 Tagged abalone were 'planted' along the California coast in the 1980s and early 1990s. Many college groups and dive clubs took part in this as well as researchers and government agencies. Most of the plants used 'tagged' animals so that their success might be determined later. Tagging projects included epoxy lumps with stainless steel tags, spaghetti tags, and letters or numbers put on with super glue. A few of the tagged animals were later recovered (some alive, others as shells on the beach) but the majority were never seen again. The success of these plants may never be known. 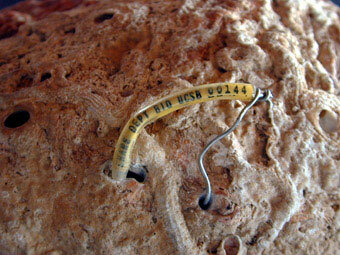 The majority of the tagged animals were maricultured abalone of various sizes but a few were the wild-caught abalone that had been used for spawning research. An invasive species of worm was accidentally introduced to mariculture farms in the late 1980s. This sabellid worm causes the shell of the abalone to deform. 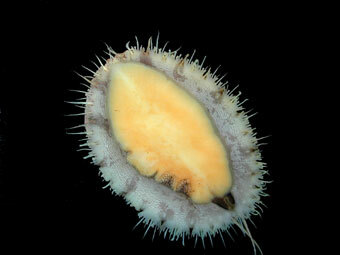 The worm forms tubes along the edge of the abalone shell but does not hurt the abalone’s body. 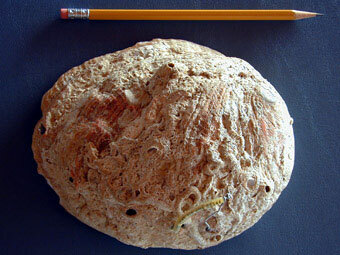 The worms feed on plankton but their tubes cause the abalone to deform the edge of the shell. The meat is still good but the shells are crumpled along the edges. After this was discovered the planting of abalone from mariculture farms was banned. 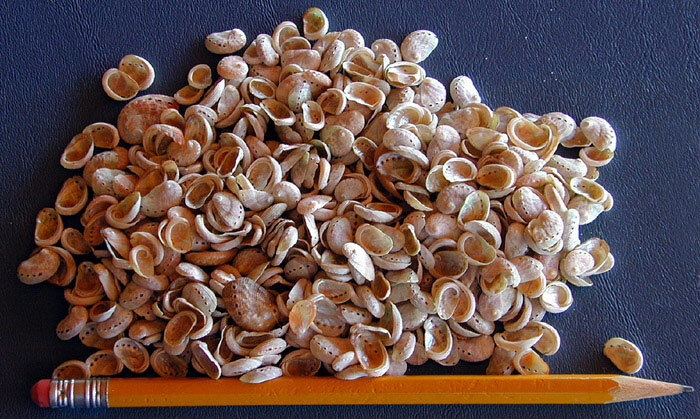 The California State Department of Fish and Game was concerned that this invasive species (from South Africa) would get into California waters by the planting of maricultured abalone carrying the worms. This might disrupt the marine ecosystem in California. Only when a mariculture farm was certified ‘worm free’ for two years could their product, once again, be planted. The popularity of abalone plants has not regained its, once popular, status. With a recent outbreak of abalone disease in Victoria Au. being tracked to mariculture, this might be a good place to mention that mariculture may not be a "cure" for the abalone as mariculture farms may promogulate and spread disease from laboratories/growing facilities to wild populations. There is still a lot to learn. 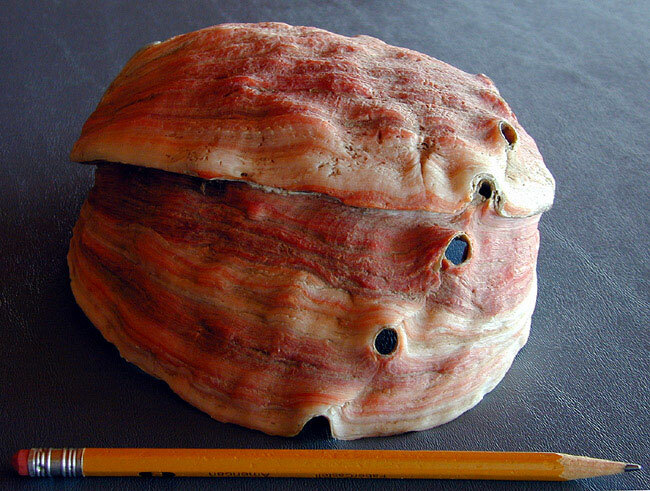 Abalone shells are used in materials research. 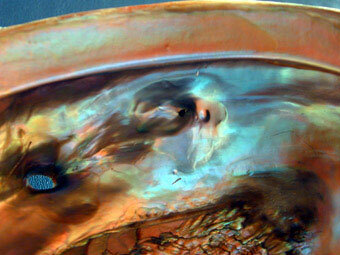 The abalone shell is unusually strong for its shape and size. Recent research into abalone shell formation has yielded important structural information in the field of 'materials science.' This research is primarily carried on, once again, by Dr. Daniel Morse at the University of California at Santa Barbara. White abalone are recently being targeted for mariculture. Most of the mariculture (for food) has been done using red abalone (and some green). The United States National Marine Fishery Service reported that the numbers of white abalone had declined by a whopping 99 percent in the last thirty years. This prompted several research dives looking for remaining white abalone beds. Only a few were found and these consisted of older animals often spread far apart. On a submarine dive around the Channel Islands, in California, only 157 total animals were found before the white abalone was listed as an endangered species. That type of population spread clearly would not be producing many baby white abalone. Fifteen animals were taken to use as broodstock to create a population of hatchery raised white abalone. Two separate sites were selected (one at the University of California at Santa Barbara under Dr. Morse and the other at Proteus SeaFarms International, a private hatchery). Efforts to spawn these rare animals were successful starting in 2001 and there were thousands of young white abalone being raised. 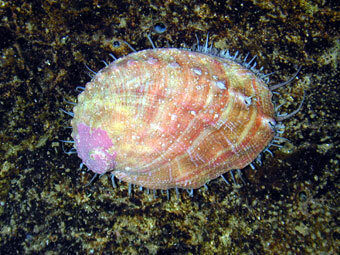 The white abalone at Proteus subsequently died (from a disease), forcing a re-thinking of the plan to use a captive breeding program to repopulate this species in nature. It may be that the die-off was a blessing in disguise as the disease was not released to the wild by outplanting. Extreme caution should be exercised in the future to prevent the release of diseases that may be harbored in mariculture facilities. A recent case in Victoria, Australia of the release of a devastating herpes virus into wild abalone populations was traced to mariculture, and is a case in point. California’s abalone has been an interesting story of success and failure. The abalone's near extinction in California from both human and natural causes has been countered by scientific achievement in controlling its reproduction to the point that it may be successfully maricultured providing food, shell material for jewelry, structural secrets, and seed (to replenish the wild stocks). We wish every species could have so many important successes. Plans are afoot to start a small intensively managed fishery. This is in the area of San Miguel Island in Southern California where stocks have been closed to fishing since 1997. In 2005 the California Abalone Association, a group of former commercial abalone divers, initiated a program to collect baseline information. Such data had never been collected on the red abalone population there. At least two years of data involving not only the former abalone divers but also divers from the California State Department of Fish and Game, the National Park Service and the University of California at Santa Barbara have made this one of the most cooperative data gathering projects in California. This research shows that abalone recovery has and is occurring at San Miguel. Opening a fishery for abalone would be managed by a 'Total Allowable Catch' and a range of innovative controls never attempted in California. Maybe this time man will be successful at managing this traditionally important resource. Stay tuned for updates.